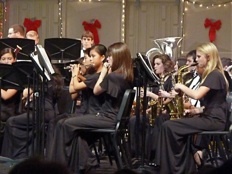 The Jupiter High School Band program offers many performing ensembles in the form of band classes and co-curricular activities in which the JHS student can participate. 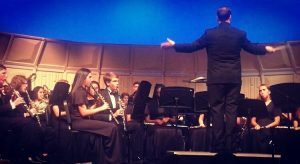 The JHS Wind Symphony is the premier performing ensemble of Jupiter High School, made up of the most advanced players and will perform several concerts throughout the year. Wind Symphony members will have the opportunity to study and play the most challenging music, examine music theory, and develop their ear training. Membership in this ensemble will be based on audition and the Director’s approval. This class is an honors credit course. -Participate in the Spirit of Jupiter’s Marching Band OR participate in another performance group, such as youth orchestra, all district honor band OR all state honor band. -It is open to sophomores, juniors, and seniors; ninth graders may NOT audition for Wind Symphony, unless they participated with the all-district and/or all-state honor band their 8th grade year. * Dropping marching band or performance group will result in immediate schedule change from wind symphony. Symphonic Band open to sophomores, juniors, and seniors; ninth graders may NOT sign up for Symphonic Band. It is designed for the intermediate high school band student and will focus on the techniques of individual and group performance. Symphonic Band will offer the student an opportunity to study and play a wide variety of music. Students in this ensemble will be required to perform either a solo or an ensemble on a grade 5 music (or higher) at the FBA District evaluation and will be required to audition for All-District Concert Band. Membership in this band is based on the Director’s approval or audition. Students in this ensemble will be required to participate in the Spirit of Jupiter’s Marching Band OR the Spirit of Jupiter’s Pep Band which performs at Friday Football games and marches in parades. Freshman Band is the entry level performing ensemble at Jupiter High School. Membership in this band is open to all ninth-grade students, even students with no previous music experience. It is designed for the beginning high school band student and will focus on the techniques of individual and group performance. Students in this ensemble will be required to perform either a solo or an ensemble on a grade 4 music (or higher) at the FBA District evaluation and will be required to audition for All-District Concert Band. Students in this ensemble will be required to participate in the Spirit of Jupiter’s Marching Band OR the Spirit of Jupiter’s Pep Band which performs at Friday Football games and marches in parades. Jazz Ensemble is made up of the students at JHS who have interests in the musical styles of Jazz, Swing, Rock, Pop, and Latin. The focus of the class is to be exposed to a variety of musical styles. A strong understanding of how to play classically is a must before you can be in the jazz band. The Jazz Ensemble performs regularly in the community. Percussion Ensemble is designed for percussionists. Students will learn percussion technique, playing in an ensemble. Students in this ensemble will be required to perform either a solo or an ensemble at the FBA District evaluation and will be required to audition for All-District Concert Band. Students in this ensemble will be required to participate in the Spirit of Jupiter’s Marching Band. Color Guard is designed to develop movement to music incorporating dance, flag, rifle, and sabre. Members perform with the Spirit of Jupiter Marching Band and compete in local circuits in the spring. Students are required to participate in the Spirit of Jupiter’s Marching Band. This class is an honors credit course. 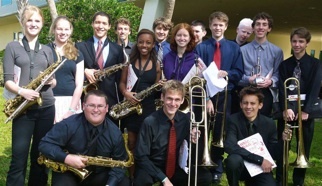 The Jupiter High School Band Program offers several co-curricular ensembles that rehearse and perform after school and on weekends. These ensembles require a “Fair Share” band fee to pay for uniforms, travel, instructors, show and music design, etc. Students participating in these ensembles must be enrolled in a band class.